I hit the road in the mid-1970s and traveled with grifters and drifters all over the South, in a saga that leaps off the page like a season of "Carnivale" on HBO. The book is a must-read for anyone who ever thought of following the sawdust trail. It's laden with Americana, as our journey took us through the wilds of Appalachia and the mild miles of the Midwest, as well as into the deep south where we found the Klan alive and on the attack. In my signings so far I find that everybody has a question about the carnival - from why the games are so hard to win (I know the answer), to whether I met any real freaks (I did) or worked with hanky-panky and hootchy-kootchy (I did). I have the real scoop on this fascinating underworld and I've told all in With It. A carnival ride owner once told me that his set-up crew intentionally leaves a hole or two in the fence surrounding the midway. The laws of carnival economics say that a person who sneaks into a carnival for free actually spends more money on rides, food and other amusement than the person who pays full gate admission. It is exactly this kind of behind-the-canvas-tent insider information that is woven through the narrative fabric of "With It," the debut novel of Dobson author and News & Record book reviewer Barbara Bamberger Scott. The year is 1976. Curious about carny life from a 10-day stint selling tacos at a Southern state fair, the female narrator, her husband Zach and young daughter Moon decide to go on the road: "I was entranced by the magic of the midway. There's romance about taking to the open road that stirred my heart." 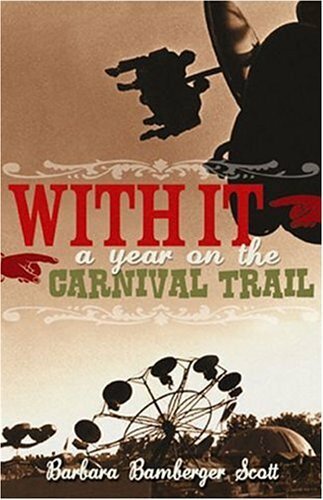 And when you join the carnival, you are said to be "with it," a term that serves as both a badge of honor and a succinct book title. The innocent trio is absorbed immediately and utterly into the foreign culture of the carnival: "Two months ago, we'd been an average little family, safe in our home, relying on television for entertainment and newspapers for information, concerned about balanced diets and efficient soap powders. Now we hardly knew what was going on in the world." For half a year, they make their way through Appalachia (where impoverished citizens are easily parted from their paychecks) and the Midwest (where wholesome farmers don't like spending money), returning in a full Ferris wheel-like turn to the original point of departure in the South in time for the state fair. Dense with carny slang and detail, Scott's episodic tale and edge-of-camp characters are reminiscent of some of John Steinbeck's work. Even her colorful chapter headings echo Steinbeck's "Tortilla Flat," as in "Chapter 11: In Which We Calculate the Price of Water in Hell, The Crawfish Kid Goes to Court, and Fargo Finds a Morphodite." In addition to introducing a cast of predictably bizarre carnival characters (the aforementioned Crawfish Kid, Gypsy Davy, Sam the Chimney Man), Scott's road show takes us to a range of locales, including county fairs, Shriner fund-raisers in shopping center parking lots and set-ups in pastures at the edge of town. Most dreaded are the "still dates," where the cash-flow-challenged carnival rookies face "The dubious boon of setting up in a deserted parking lot at a time when the weather is uncooperative, the marks unwilling, the jointees unhappy and the ride help unwashed as usual." Scott is part anthropologist, linguist and economist in her portrayal of carny culture, which is based on her own experience working in the business. There's even a five-page glossary of carnival terms at the back of the book, helpful whenever you come across sentences like this: "We discovered that there are three general types of gaming concessions in the carnival - flats, alibis, and hanky panks." She accurately depicts the pecking order, social castes and motivating factors in carnival life: "Reliable help is hard to find in the carnival business - it's almost a truism that anyone who'd work in the business would be somewhat unreliable by definition. ... A carny is somebody who will work like hell to avoid having a steady job." Yet Scott's narrator and her family never quite fit into their adopted culture. They are in some ways outsiders to a carnival community consisting completely of society's outsiders: "Perhaps the jewelry joint was a bright reflection of my scruples. I never had to feel that anyone left the joint unsatisfied. It was easier for me than selling "air" - the air that blew through a cork gun ... the air that blooms into cotton candy, the hot air of the alibi or flatstore agent. ... We wanted a joint that had the possibility of being won fair and square. We were not prepared to totally abandon our middle class moral code...."
While Scott's writing occasionally strays into cliche and confusing imagery ("I swallow a mental lump of salt"), it can suddenly reveal a gift for simple and elegant prose: "We woke to find freezing rain pouring in under the bally cloth. Our bedding, clothing, donkeys, and bears, all were drenched and stiff. Our dear friend Kenny ... looked as though he had just been born." Or this especially poignant passage, describing a last wistful walk along the empty midway: "Before pulling out, I walked around the lot, locating places where each joint had been. The grass was ruined now, mashed and yellowed by joints and trucks. I spotted a small rectangle where the jewelry joint had sat, with a few broken chains in the dirt. There was a huge rectangle that had housed the doll glass pitch with the grass all around it flattened where the marks had stood to toss their dimes." "With It" reads more like memoir where only the names have been changed. It's a fairly simplistic story told in straightforward, expository prose; hardly the plot and character development you'd expect in a complex work of literary fiction. If you have your sights on taking home a giant purple, stuffed teddy bear of a novel, then you may be disappointed. But if you approach "With It" as autobiography dressed up with streamers and lights for the carnival midway, it can be an enjoyable form of amusement. Jon Obermeyer is a poet and book reviewer who has also written three circus program guides for Ringling Bros. & Barnum and Bailey's The Greatest Show on Earth. As a volunteer in the 1980s, he donned a canvas apron to sell exact-change tickets to the GYC Carnival in the Greensboro Coliseum parking lot. Copyright 2005 Reproduction or use of the text or images in any form are prohibited without the written permission of Sideshow World or their respective authors. Review re-printed at the request and permission of the author. For further information. drop us a line.